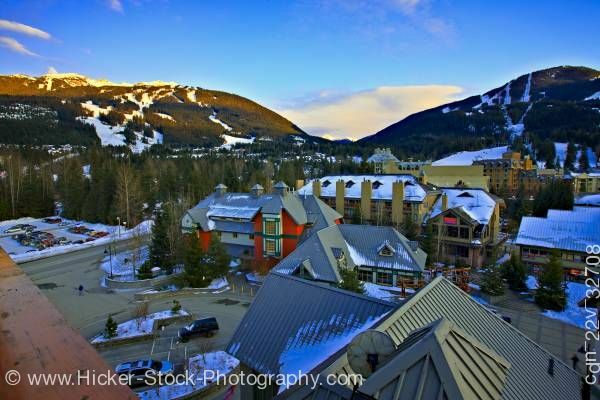 Stock photo of Blackcomb and Whistler Mountains as seen from the Pan Pacific Hotel in Whistler Village, British Columbia, Canada. Although the village and most of the mountains are in shadow, it is a bright sunny day with clear blue sky in the background. This stock photo includes Blackcomb (2440 metres/8000 feet) and Whistler Mountains (2182 metres/7160 feet) seen from the Pan Pacific Hotel in Whistler Village, British Columbia, Canada. The two previously separate ski areas of Whistler and Blackcomb were integrated into one operation in 1997. Ticketing, pass, and access control systems for the two ski areas were fully integrated in 2003. Together, Whistler and Blackcomb form the largest ski area in North America at 8,171 acres (33 km2), 54% larger than that of Vail, the next largest, which has 5,289 acres (21 km2). Both mountains have some of the largest lift-serviced vertical skiing in North America, with Blackcomb having the most at 1,565 m (5,133 ft). Whistler has slightly less vertical at 1,530 m (5,020 ft). The highest lift elevation, on Blackcomb, is 2,240 m (7,349 ft).